Through Timesheet Unit you can manage your Tasks and Expenses relavant with Project Work Packages that your manager has assigned to you. Once a Project Work Package has been assigned to you, you receive a Process Notification viewable and accessible through Notifications Bar. 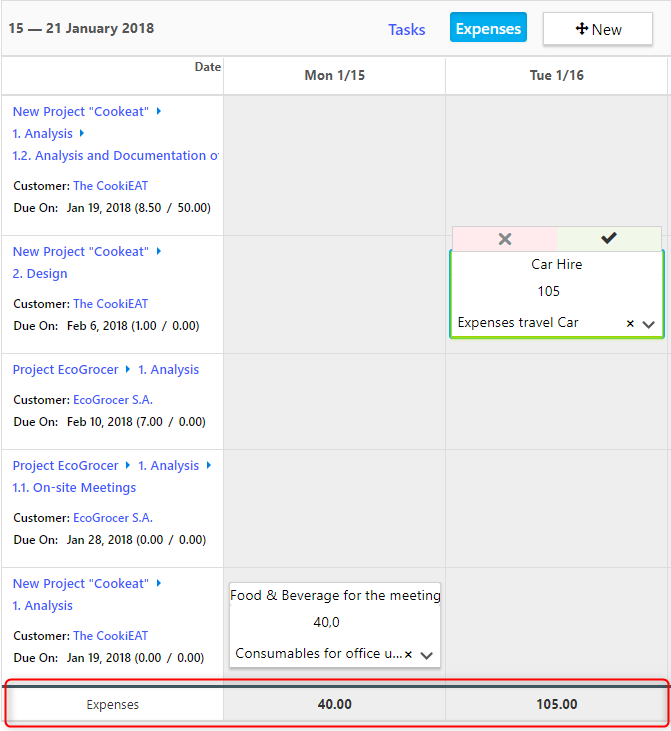 If you want to access Timesheet Unit, go to Application Menu Icon > Collaboration >Timesheet. The Timesheet consists of Filters area and a Weekly Calendar into which you can add, view and manage your (all) Processes’ Tasks and WorkPackages’ Expenses. Especially from Timesheet, you may track hours spent in Processes (Generic Processes, WorkPackages, Events, Trainings, Job Posting, Ticket, Opportunity, Campaign) or track expenses of WorkPackages. Timesheet Filters are common for Tasks and Expenses. You may Search Processes by Title or with Process Type or by selecting one Process of the list-when clicking on Process drop-down list you see only the Processes which your manager has assigned to you. Account: Clicking on Account drop-down list you see only the Accounts relevant to at least one Process that someone has assigned to you. Check Processes that are Assigned to you (Mine), to your team (My Team’s), to either you or your team (Assigned to Me or My Team), OR Created by you (Created by Me). Also, you may filter the booked this week, too. Also, you can Sort them by Booking create date, Process Name, most active Process or Due Date. View only Task type such as Normal, Overtime Hours, Sunday, Saturday, Nightwork, Public holiday work. View only specific State of Task or Expense. 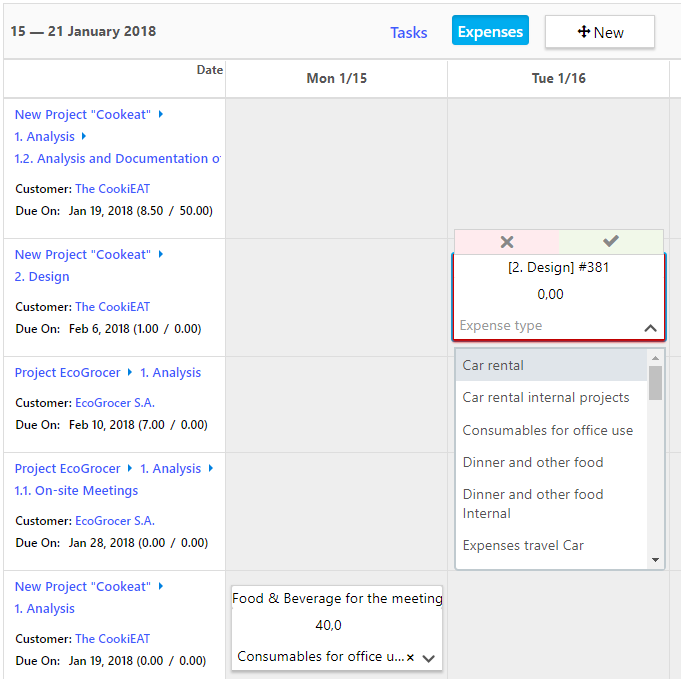 You can select to Hide empty rows check box, which allows you to view only the Processes which have already created tasks or see all of them in order to add an new task to an empty Processes. Hide autobook will hide all the Projects’ WorkPackages, which were automatically booked to you – without accepted Booking request from your Manager-. Finally, clear button erases all the used filters, while Execute button displays the respective tasks or expenses. Anytime you wish, you can hide the filters clicking on the respective icon ‘-‘, to focus on the Tasks or Expenses displayed at the below Weekly Calendar. If you want to apply different filters, you can click on plus icon ‘+’ , change them and click execute. Weekly Calendar can switch between Processes’ Tasks Calendar and Work Packages’ Expenses Calendar through the Tasks and Expenses buttons, respectively. At the top-right corner of calendar there are arrows enable you to navigate to different weeks. Today transfers you quickly to the current week. The Process that the Work Package belongs. Personal Workload which is the actual duration of tasks performed by you below this Process. Workload which is the scheduled duration of tasks below this Process. Today’s date is light-yellow highlighted, Absence days are highlighted in Yellow and Public holidays days are highlighted in light blue. In order to add a new Task, go to Application Menu Icon > Collaboration >Timesheet. Ensure that you have selected Tasks tab. the task title as a brief description of what you have done. the scheduled task duration. There are two ways to populate the duration of your task. You can either type the exact duration and use the arrows button to increase / decrease the duration, or click on plus icon and enter the start and end time. Finally, fill the actual task duration. Click outside the cell to save the task. Especially for pre-booked WorkPackages’ Tasks, scheduled duration may be already added and task already created. Read how to manage a Task below. Furthermore, at the Tasks Weekly Calendar, the column of a specific date might be yellow or blue. This indicates that there is a scheduled absence day or a company holiday, respectively. Adding a task on a company holiday or a scheduled absence the system informs you with a relevant pop-up message at the top of your screen. In order to view or/and manage Process tasks, go to Application Menu Icon > Collaboration >Timesheet. Ensure that you have selected Tasks tab. Here, you can see all your existing Process Tasks on your screen based on your used filters. 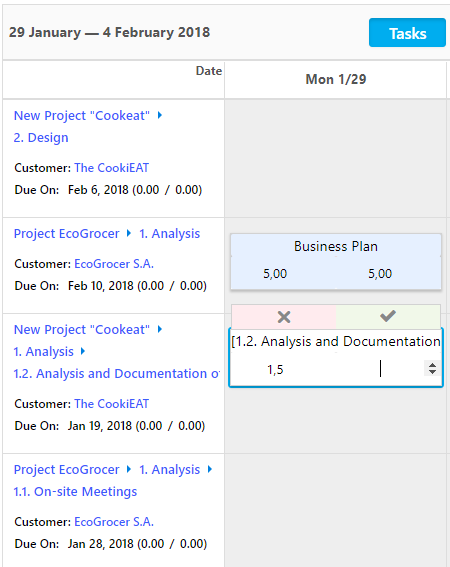 Process Tasks may have different colours: White for tasks that are not completed and they are the only ones still editable. Light green, in case that the project manager(s) have approved a completed task. 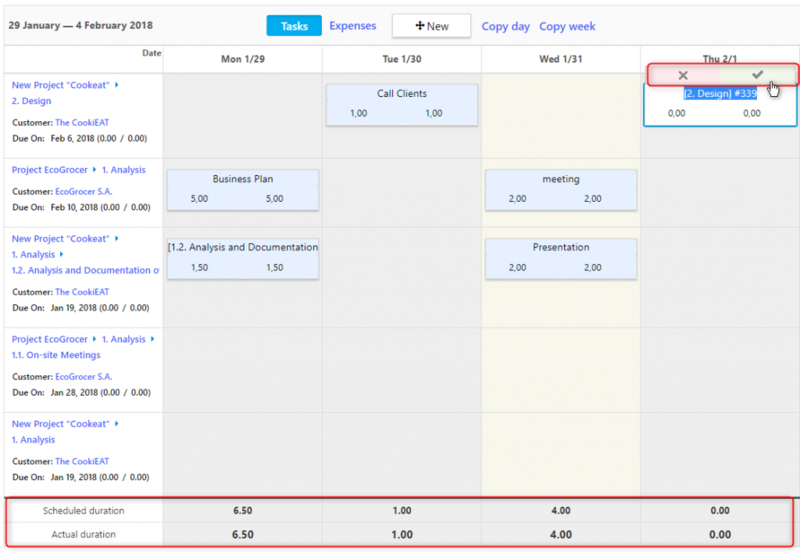 At the bottom of the Tasks Weekly Calendar, users can see the total scheduled duration and the total actual duration per date. Then, check the Remaining capacity for a respective date by hovering your mouse above the date. Weekly capacity is also available. Find the task you wish to manage based on its Process Name and Date. Click the specific cell form in order to change any information you wish. After editing you can either complete or delete the specific task from the cell’s check button or erase button, respectively. By pressing Copy Day or Copy Week, you may copy tasks to following days/weeks. Once you complete the task you cannot do anything to change it from the Timesheet Unit. While a task state is changing to complete, you also cannot change any field of the task cell form. Otherwise, a relevant message appears on the top of your screen. Firstly, go to Application Menu Icon > Collaboration >Timesheet. Ensure that you have selected Expenses tab. the expense title, briefly describing the reason of your expense. the expense amount. You can type a specific amount or/and use the arrows to increase/decrease it. the expense type, selecting among the choices of the drop-down list. If you want to change the expense type you can click on cancel (x) button and select a different one from the drop-down list. Go to Application Menu Icon > Collaboration >Timesheet. or light green, for expenses that the project manager(s) have approved. At the bottom of the Expenses Weekly Calendar, there are the total expenses per date. Find the expense you wish to manage based on its Work Package and Date. Then, click the specific cell form and change any information you wish. After editing, you can either cancel the specific expense or upload a receipt using the cancel (x) button or the upload button, respectively. People’ s Managers in Team Task Approvals unit will review all Tasks of Processes that you add via Timesheet. People Managers and Project Managers will see Tasks of Project’s Workpackages in Team Task Approvals unit and Task Approvals respectively. Project Managers will see Expenses of Project’s Workpackages in Project Expenses Approvals unit.